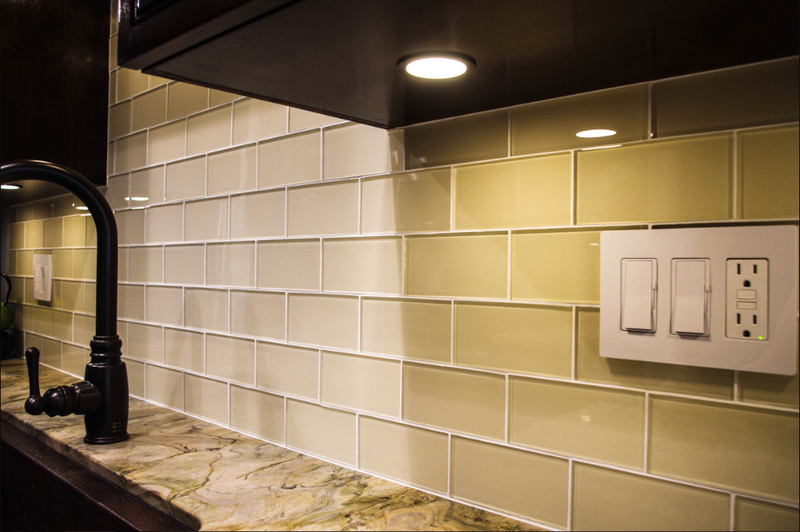 Subway tile backsplash is a great way to protect the wall from splashes and smears as well as accentuating your kitchen or bathroom. However, subway tile backsplash can be somewhat tedious due to the monotonous installations. In fact, subway tiles are quite versatile meaning they can be installed in a wide array of styles. 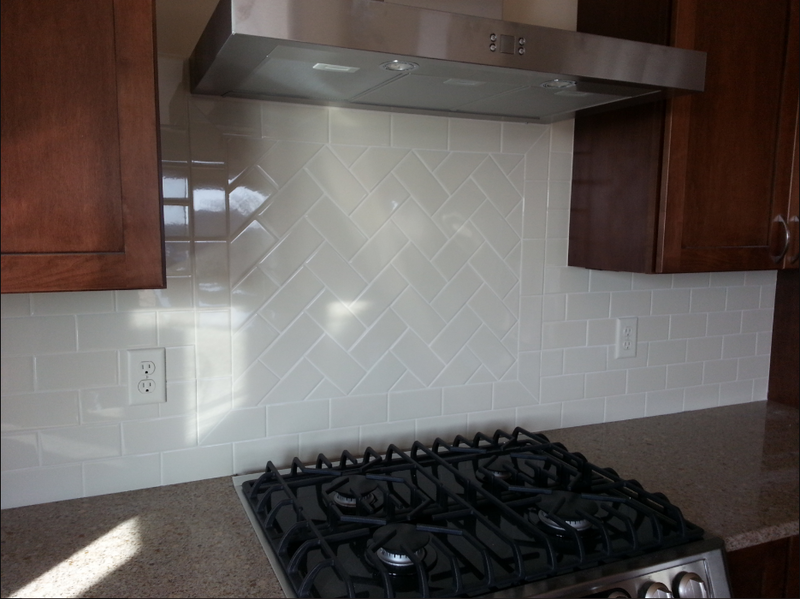 Did you know that subway tile backsplash is not only arranged horizontally? Did you know that it can be combined with any other tiles to create distinctive look? By harnessing the versatility of subway tile backsplash and the power of creativity, you can create an impressive backsplash for your kitchen and bathroom vanity. Read on to find 20 creative ideas of subway tile backsplash. Instead of using those rectangular subway tiles, you can install some smaller tiles for your backsplash and create a mosaic look. This backsplash uses various shades of black and green colors to make distinctive pattern. The wide array of green colors look dazzling when the under cabinet lightings shed a light on them. The vast array of colors makes the backsplash look fabulous in diversity. The small tiles reflect the light that is shed over them, making them keep twinkling. Installing the tiles will be arduous. 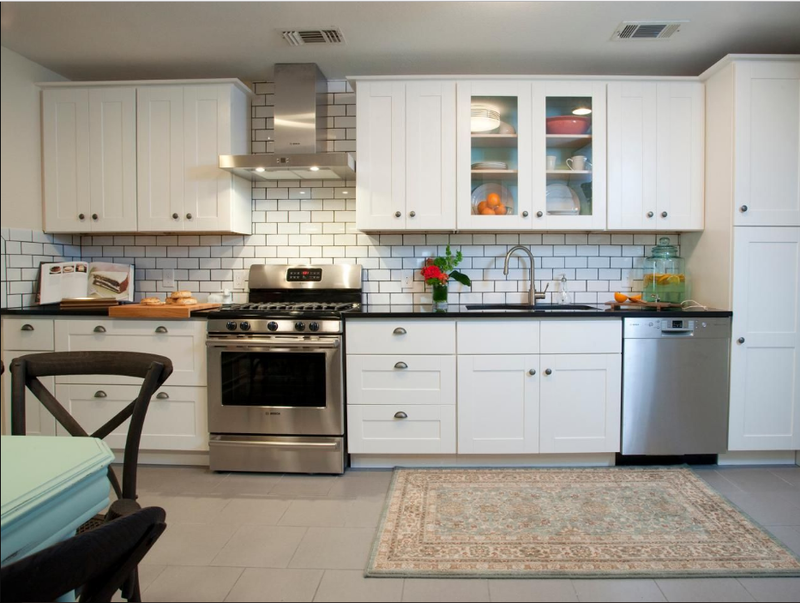 Add a classic touch to your vintage kitchen by installing white subway tile backsplash. 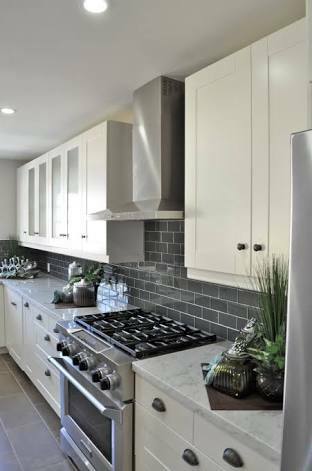 Perhaps, white subway tiles are the most ubiquitous tiles that are used for backsplash. You may find them easily in any kitchen styles. The versatility of white color makes it suit any kitchen styles and complements any colors very well. 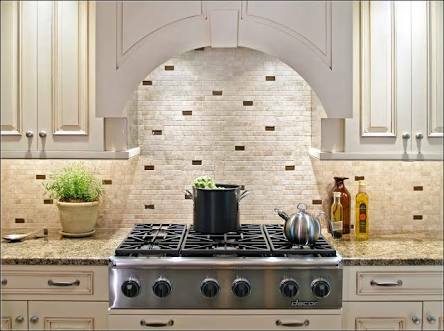 Therefore, white subway backsplash can be your safe bet when you do not want to take the risk of imbalance look. Somehow, white tiles are considered to be dull color. But you can make it more attractive by making bold groutlines that accentuate the plain white. The initial objective of installing backsplash is to protect the walls from unwanted dirt and stain that can be hard to clean or remove. 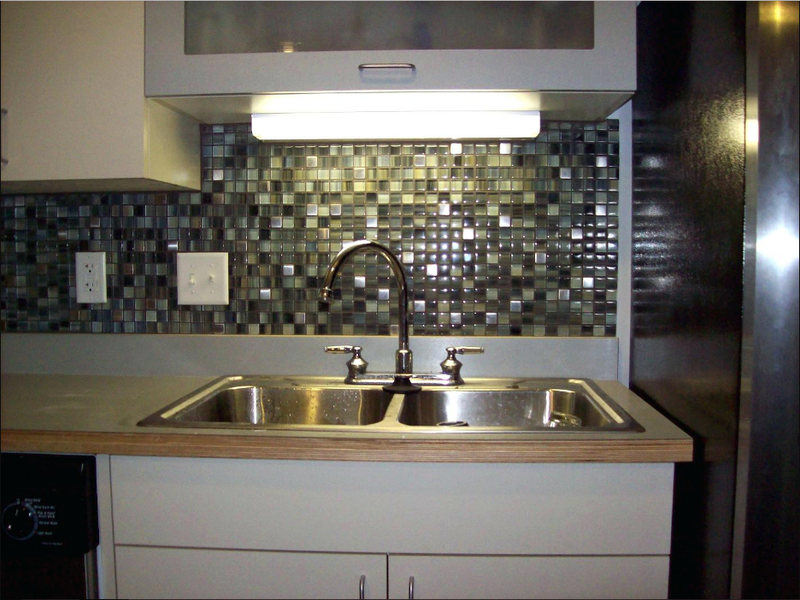 Thus, the backsplash should be made of cleanable materials such as glass. 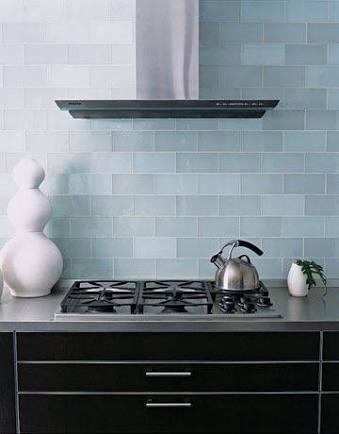 These glass subway tiles make a top-notch protection to your walls as well as being an easy-to-clean backsplash. You do not have to break a sweat when it comes to cleaning the splashes resulting from oil and grease. The beige color of the tiles complements the statuario marble very well, enhancing the elegance of this marble countertop. To make the backsplash look better, white grout lines are added. Grey is another versatile color that can fit any kitchen styles very well. Just like this modern kitchen. It uses monochromatic theme, creating an elegance-in-simplicity look. Everything is painted white, black, and grey, including the backsplash. Installed horizontally, these grey styles may seem so yesterday. However, backsplash will be nothing if it cannot interact and work together with the other colors in the kitchen. For some people, playing with colors are challenging and thrilling. Unfortunately, the result might be dismaying. Therefore, choosing subway tiles that belong to the shades of the countertop or the cabinet can be your safe bet. Backsplash is usually installed behind the stove because this area is prone to being splashed by oil which can damage your walls. 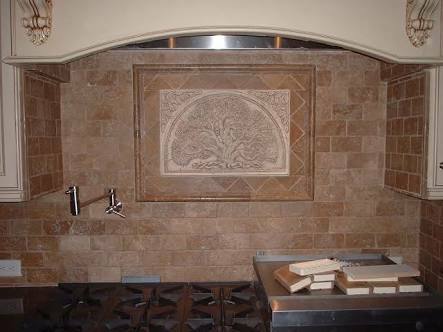 Since it is installed behind the stove, meaning the area that you spend your time most, the backsplash has to be epic. If you think installing subway kitchen backsplash horizontally is such a mainstream arrangement, try installing them in a different way. You can create a focal point whose pattern differs from the remaining backsplash area. Although the tiles used as the focal point have the same color as the rest of the area, the pattern scan distinguish them. How much time do you usually spend to wash up? Do you often find yourself lingers for a few minutes to invigorate yourself in the bathroom vanity? It seems that bathroom vanity is one of many homeowners’ favorites. They wash up and brush their teeth in the vanity. Ladies tend to spend more time in front of the mirror of the bathroom vanity just to make sure that everything is flawless, so that they are ready to go. As a place where people spend most of the time to wash up, bathroom vanity deserves decorating. Covering the wall using subway tiles backsplash can be a two-in-one adornment. The backsplash can protect the wall from the unwanted splashes. 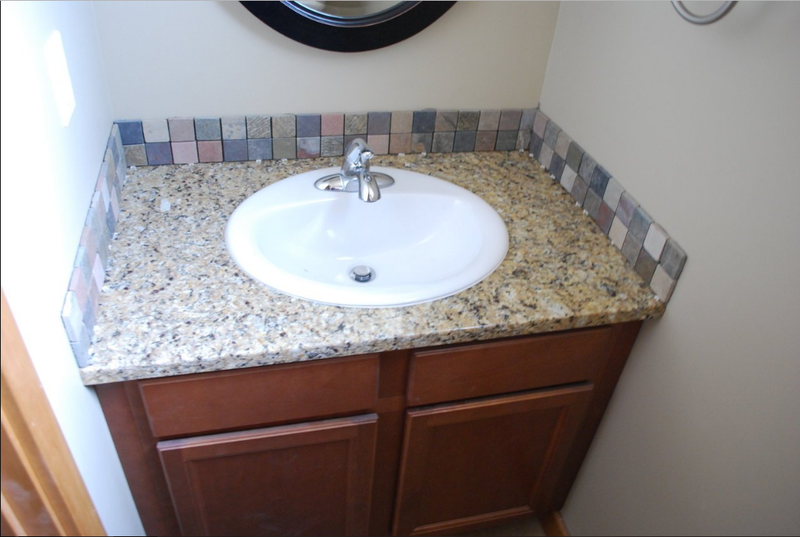 Furthermore, the colorful tiles add aesthetic touch to the vanity. Some tiles are only installed in a certain area that is prone to splashes and smears. However, some homeowners have taken backsplash to the next level. The tiles are not only forcertain areas, but also the whole part above the countertop. The backsplash of this kitchen makes it look elegant. It complements the countertop and cabinets a lot, making the kitchen look great. White may be the safest color for any refurbishment, even classic rectangular tilesare the most versatile ones, making them become everyone’s favorite or at least everyone’s choice when they have no idea what tiles they should install for the backsplash. White tiles always do in a pinch. The white tiles cover the whole exposed walls along the countertop. 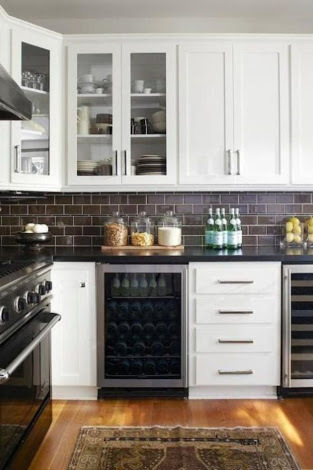 No matter what style and color dark, soft, bright, or matte finish are used in the kitchen, white subway tiles have never failed to blend with the other furniture. This kitchen creates calming ambiance with soft beige color. Nothing can beat the elegance and calmness of soft beige. And this kitchen is a top-notch one, thanks to the under cabinet lightings that accentuate the soft color by shedding the lights over the backsplash. Instead of using wide rectangular tiles, this kitchen uses tiny rectangular tiles made of natural stone to create an even surface. 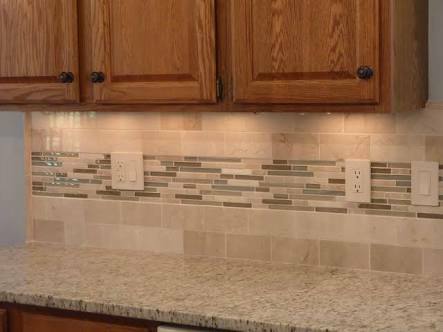 The backsplash also features some dark brown tiles to give special patterns in the backsplash. Stainless steelsare widely used for any kitchen appliances because they give many benefits. 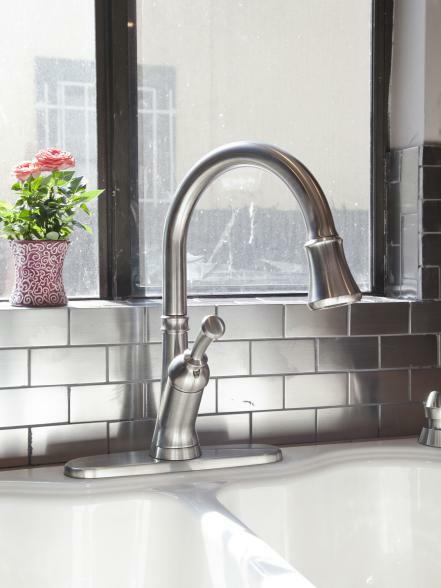 Now, you can harness the versatility of stainless steels for your kitchen backsplash. The silver metallic of stainless steel tiles reflects all the things that sit in front of them, creating amirror-like effect. The tiles also complement the silver-finished faucet. The tiles are easy to clean since they are made of stainless steel. The tiles are also durable. This luxurious kitchen emphasizes on natural look which is represented by the use of shades of brown including the kitchen cabinets and the backsplash. The backsplash uses the shades of beige from the lighter to the darker one to create artistic tone. The backsplash would look so dull if the tiny tiles thatshow distinctive patterns were not there. What makes them unique is the variety of colors teaming up to accentuate the larger beige tiles. 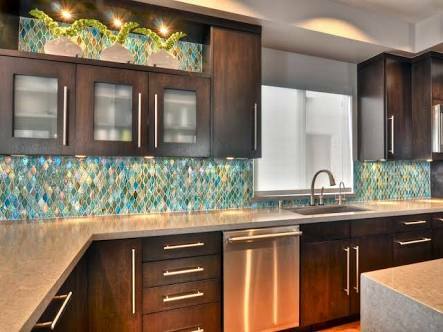 The tiny tiles make a great focal point as well as accentuating the luxury of the backsplash. Installing the tiny tiles manually will be arduous and take a lot of time. Simple yet impressive, that is what this kitchen is all about. Sleek design of white kitchen cabinets are combined with black countertop, creating monochromatic modern kitchen. To fill the gap between the cabinets and countertop as well as protecting the walls from splashes, dark brown tiles are installed. Dark brown tiles with white grout lines complement both the dark side of black and the bright side of white. They also suit the wooden floor very well. 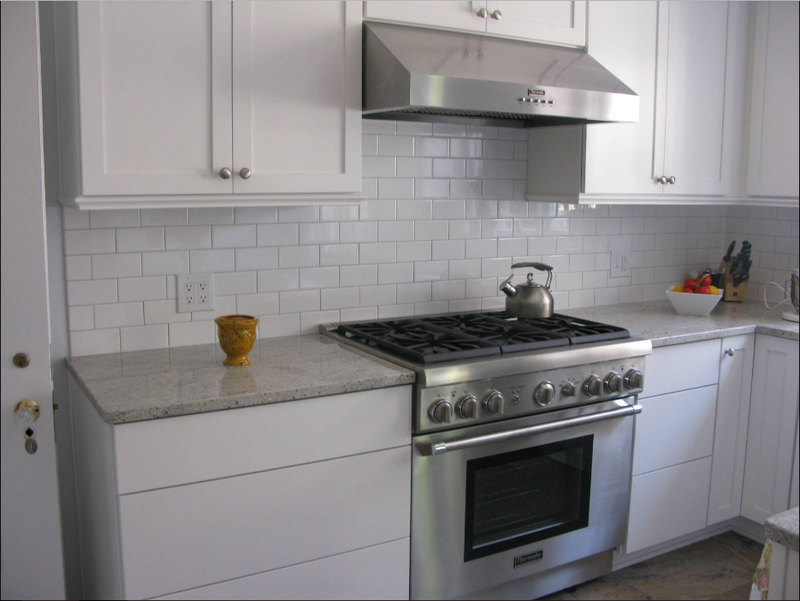 White and horizontally-arranged backsplashes are the most prevalent backsplash installations. You can even find them in most kitchen. Now, it is time for you to explore the versatility of backsplash and create a distinctive kitchen. This multicoloured tiles are arranged meticulously to form twinkling effect as if the backsplash were made of diamonds. Backsplashes usually use the color shades that are similar to either the countertop or the kitchen cabinets. However, this backsplash try something different from the ubiquitous subway tiles. Surprisingly, it turns out well in embellishing the kitchen. Rustic look has never failed to add an elegant touch to any kitchens. The use of distressed metals or woods and roughly finished walls provide the natural look of well-worn kitchen. To protect the walls from oil as well as enhance the rustic look, distressed brown tiles or wooden-like tiles can be used. To make it look better, add a decorative carving that shows the power of nature. It will be the focal point that will amaze everyone. 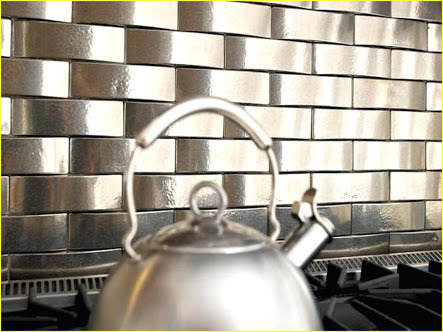 Glossy grey subway tiles arranged horizontally add traditional touch to your kitchen. Since grey is one of the most versatile colors, you can use them in any kitchen styles with any colors. By adding grey subway tiles to your kitchen backsplash, you will be able to spruce your kitchen up and make your kitchen look like an inviting one. Are you really into steampunk kitchen style that gives a touch of industrial look? You can apply this style to your kitchen by using copper or brass kitchen backsplash in that copper and brass finish are significant features of steampunk styles. This brass backsplash can be cleaned easily with water, so you will not break a sweat to get rid of the dirt on the surface of the backsplash. The tiles are a little bit curved so that they form uneven surface that can reflect light beautifully. The reflection of the lights make them look like golden backsplash. Vintage style is usually synonymous with soft pastel colors such as mint, cream, or turquoise with matte finish. Another significant feature is the use of eclectic stuff to jazz the room up. 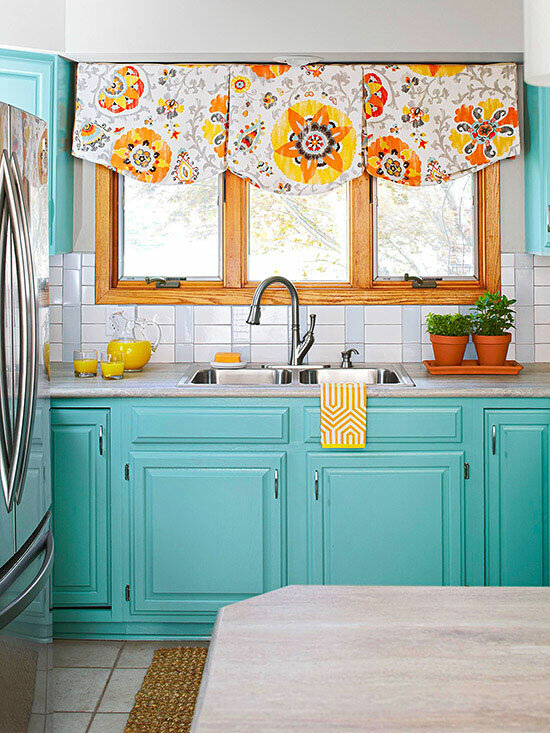 This kitchen uses turquoise backsplash to embrace the vintage style. The backsplash, denoting the style, does not have to relate to the harmony of color because the idea is to mix and match a wide array of colors and furniture. Although the turquoise tilesdo not match the black lower cabinets, they can still work together to create beauty in diversity. Vintage style is clearly defined from the soft blue of the lower cabinets. And the backsplash has perfectly united the upper and lower cabinets, making them form a harmonious bluish and whitish hues. Enhance the vintage look of your kitchen. Provide a cheerful ambiance represented by various bluish and whitish hues arranged randomly. Installing the tiles take a long time due to the tiny size and manual installation. Adding rustic look to your kitchen can be a great idea to spruce it up because it can provide a unique style to your kitchen. Although rustic furniture makes the room look well-worn, many homeowners prefer its distinctive look for their kitchen. 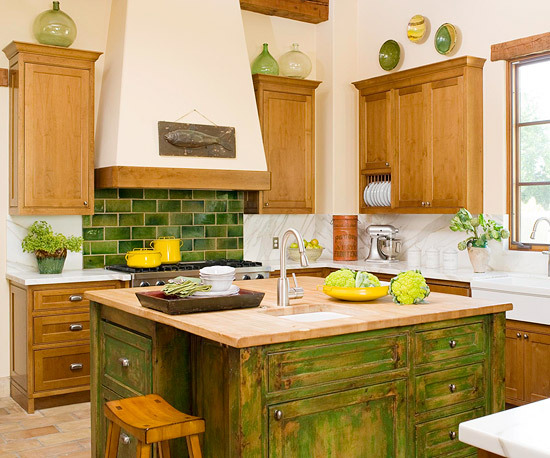 Just like this rustic green kitchen. When coming into this kitchen, you will be amazed by the rustic look of the countertop and backsplash among the sleek furniture. The green backsplash is conspicuously unique. The distressed tiles give them the effects of old stuff. 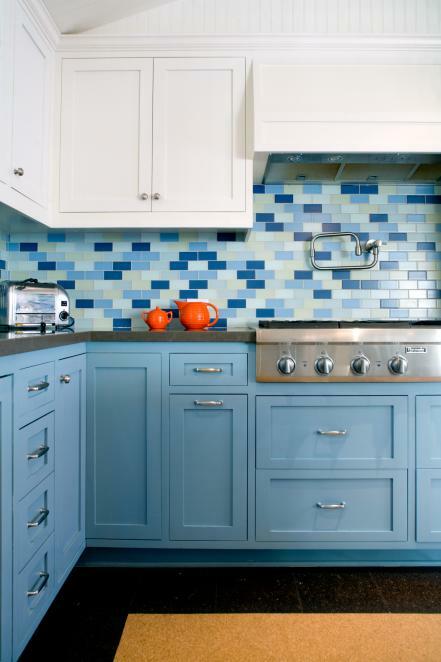 Get rid of the dull of white subway tile backsplash by adding another color and pattern in it. Just like this backsplash. The white subway tiles are installed horizontally, as usual. However, somelight blue subway tiles are installed vertically between one row and another to create defined borders. The backsplash only givesa subtle nuance to the kitchen with its neutral color without overwhelming the conspicuous kitchen cabinets and curtains. Those are 20 creative subway tile backsplash ideas that you can apply for your next refurbishment project. 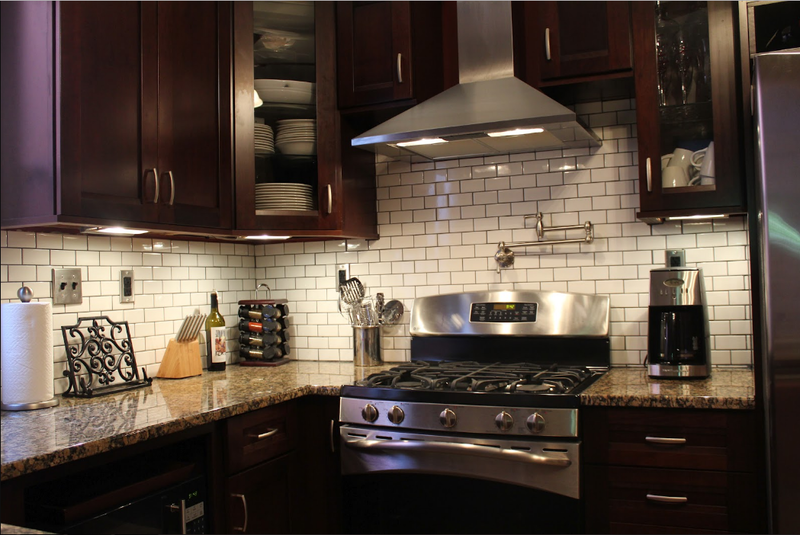 Subway tiles are great for backsplash because they are usually easy to clean. 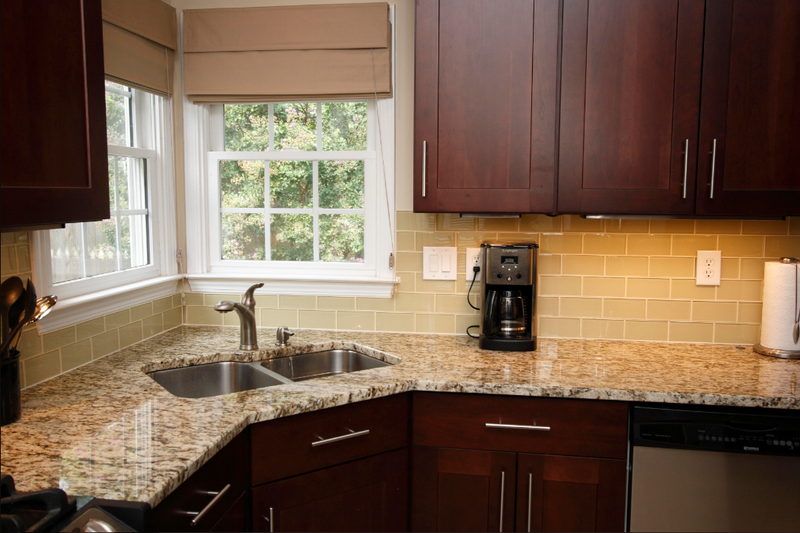 Before installing the backsplash, you need to consider the colors and styles of your kitchen. White tiles can be combined with any colors, but it will be better if you add another color to the backsplash to eradicate the dullness. « 15+ Kitchen Lighting Ideas for Any Styles, Newest ! !